Kim Hollis: Spectre, the newest James Bond film and the last one to feature Daniel Craig, earned $70.4 million this weekend. What do you think of this result? Ben Gruchow: This isn't bad at all, although it throws under most predictions (BOP was, I think, the closest at $74 million). In terms of tickets sold, it's less than Skyfall or Quantum of Solace, more than Casino Royale, and just a little bit more than Die Another Day (8.4 million versus 8.1). I guess I would've liked to have seen the goodwill from Skyfall extend a *little* bit further than this, but Spectre had issues way beyond keeping up momentum and utilizing goodwill. Given the budget inflation, the studio frustration, a theme song that flatlines in comparison with Adele's, etc., etc., etc., the figure could have come in $5 or $6 million lower and I don't think I'd be incredibly surprised. Still, though, we're talking about a likely $220-$230 million domestic finish, which is more than any other Bond film save Skyfall. Edwin Davies: This is fine, given that response to the film has not been as enthusiastic as it was for Skyfall, either from critics or audiences, and Skyfall had the added advantage of coming out on the 50th anniversary of the Bond franchise, so there was a sense of occasion. 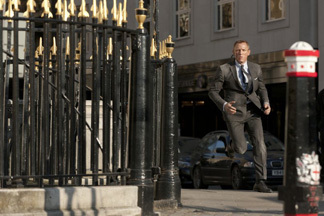 Skyfall clearly boosted the profile of the Craig-led Bond series, but Sony needed to come through with a film to match the lofty expectations created, and they didn't manage it. However, the film's performance so far overseas should ensure that it meets the $750 million worldwide total that it will need to earn to see any kind of profit. Jason Barney: This opening stateside is absolutely fine. Even though we are seven weeks away from the coveted 12 days of box office, Spectre opened within expectations. Could it have done better? Probably, but opening with $70 million is nothing to sneeze at. This is the sort of film that will still be playing on screens as we get closer to the holidays, so it will be earning a nice bit of change at the end of its run as well.